The idea that sharing rides is good has become almost axiomatic in transportation discussions. At conferences I have seen people declare that robocars are pointless if they are not shared -- ie. people who are not travelling together ride together in them. The positive of sharing is so axiomatic that public transit is seen almost as a good in and of itself, rather than a means towards real goals like energy efficiency, low cost, and higher road utilization. It has has attained this status as revealed truth because it is indeed roughly true -- more people together in a vehicle done right will indeed use less energy per person and less road space. But the "done right" is very important as it is commonly done quite wrong. As I have studied robocars, this has led me to the discovery that some of our old assumptions are wrong. In particular, more sharing is not always good, and the styles of sharing (including the vehicle sizes) of current public transportation are almost certainly not the optimum sizes, and that smaller vehicles are likely more optimal once we eliminate the need for drivers and move to a highly communicating world. I believe there are strong arguments that while shared travel is beneficial, we actually have too much of it in most transit systems, and not enough in private cars. That the "shared" future is one of van-sized group vehicles with a mixed fleet of more personal cars with 1-4 seats. Sharing creates negative factors because it does not exist alone in a pure world. Shared transportation competes with personal transportation and other forms. In the real world, travellers have different needs and income levels. Generally, the risk of all these factors goes up the more people share the vehicle, but more to the point, the "aggregate pain" always goes up and in fact can go up faster than linearly with the number of people. The greater this pain, the more people are inclined to find alternate means of transport, including car transport. A simple thought experiment can show how more sharing can fail. Imagine you have one train every 15 minutes. You could replace it with a much bigger train (but not 4x bigger) every hour, or an even larger one every 2 hours. That's clearly more efficient, but it would inconvenience riders so much that a large fraction of them would abandon the train entirely. Transit planners know that transit lines founder when frequency is too low. A more real example involves buses. Many bus lines might have one 50 person bus every half hour. But riders would find the bus line far more useful if it had a 25 person bus every 15 minutes, and vastly better with a 10 person vans every 5 minutes. The latter are a bit less efficient, but the main reason this can't be done is that today the cost of bus drivers is a major faction of the cost of the system. Those 6 vans might seem to take up more road capacity than the large bus, but even that is not so clear. 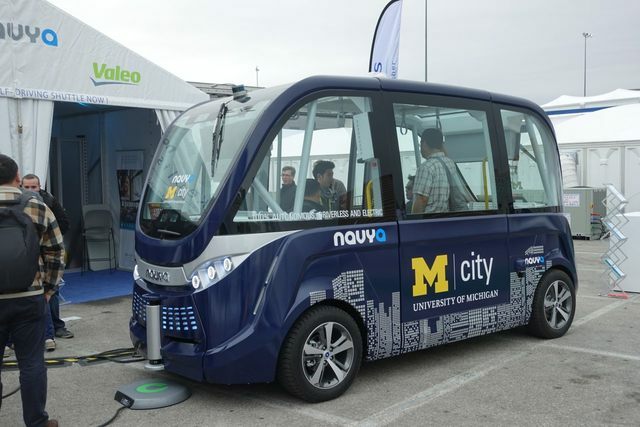 A 10 person robotic van need be no larger than today's sedans, and those are much less disruptive of traffic than large buses. In addition, the van would pass by many stops that the large bus must stop at. Stops are wasteful of energy and disruptive of traffic. The 6 vans have more capacity than the one bus, and they will need it -- because quite a few people would find the 5 minute service much more acceptable. The capacity of heavy rail and LRT compared to Bus Rapid Transit is also affected by the removal of drivers. Heavy rail might have 7 to 11 cars. An LRT has 4 cars in it, while a bendy bus can have 2, so per driver, the bus capacity seems lower. Without drivers, the bus capacity is higher because buses can stop "offline" -- without blocking the track -- so capacity can be almost arbitrarily high. Another example of the failure of large vehicles can be seen recently in commercial aviation. Airbus produced the giant A380, based on the idea that fully loaded, it would be very efficient. A380 service usually means there is just one flight a day on the long routes it serves, causing maximum inconvenience for passengers. It also takes longer to load and unload. The A380 is now viewed as a mistake, with airlines all moving towards smaller, lighter aircraft like the 787 and A350, which allow more frequent service and more nonstop service. In 2015-2017 there were net zero orders of A380s, though Emirates ordered some more in 2018. Another big factor is the load factor of the vehicles. Since you don't have an infinite budget for vehicles, you have to pick a fixed set, and when you have large vehicles, you use vehicles which are much too large for the load some of the time. The average bus in the USA has just 9 passengers on it. It's pretty efficient at rush hour, standing room only, but then it gets re-used off peak with a very light load. This is no minor thing. A bus system with 4mpg large buses gets 36 passenger miles per gallon in total efficiency. This is worse than a single person driving a 50mph Toyota Prius, and much worse than a Prius with 2 people and even worse than an electric car. Light rail vehicles, massive as they are (the "light" stands for light capacity, not light weight) do even worse. Current transit designs demand not just tightly packed, efficient vehicles at rush hour, but large empty vehicles in the reverse commute direction and at off-peak hours. Riders will not usually accept a system that can't get them home except at rush hour. (Certain commuter rail lines are the exception.) This drops the total efficiency way down. Smaller vehicles offer a solution because you can more closely size the vehicles to the load. If there are only 8 riders, you send a van or two cars, not a 40 person bus. In the above bus line, late at hight you can drop the service to every 15 or 20 minutes with small vans, and still get decent load on them while offering better service than the large bus every 30 minutes. It will surprise many to learn that the US Dept. of Energy reports that bus and light rail systems of the USA with just a few exceptions use more energy per passenger-mile than average cars, and far more than efficient cars like hybrids and electrics, which just have an average of 1.5 people per car. That the optimal sharing point is on the small end rather than the large, at least in the USA, becomes very clear. This is even true of the most efficient system in the USA, the New York MTA Subway. Most recent figures suggest it uses about 180 watt-hours/mile/passenger. The Tesla model 3 is 240 watt-hours/mile, but put the average 1.5 passengers in it and it matches the New York MTA and beats any train line in the USA by a longshot. It also beats the London Tube (250 wh/p-m in a 2004 report and many others around the world -- though European and wealthy-Asian systems do tend to do much better than US systems. While electric sedans today use 250-300 wh/mile, lightweight single person vehicles can be much more efficient in energy, and also in road space. Single person urban vehicles -- effectively robotic electric enclosed tricycles -- have been built well below 100 wh/mile. The popular platform scooters used by companies like Lime and Bird use under 20wh/mile. 100 wh/mile surpasses the efficiency of any transit line in the world other than a pure rush-hour only system with lightweight vehicles, and no transit can compete with the platform scooters. Such vehicles are also very small on the road, and one can pack many of them in the space of a bus without the level of traffic disruption caused by the large bus. Solo vehicles offer non-stop direct travel on the optimal route, which can be highly efficient. They can also serve to offer "feed" and "fan-out" for vans, so that nobody travels away from their desired route, and transfers are instant and easy. Transit's answer to the negatives of sharing is to allocate private right-of-way to transit lines, the most extreme example of which is the underground subway tunnel. Private ROW is very expensive, of course, but offers a fast and reliable path, free of congestion. There is an argument, in fact, that without private ROW, public willingness to ride transit drops precipitously. With the arrival of the robocar and other technologies, private ROW and shared travel can be now seen as more independent factors. There is no reason that robocars and robotic vans can't be given use of private ROW, either old or new. We see a first taste of this in the use of "managed lanes" (Or HOT lanes) in some cities. Existing private ROW, mostly for trains and some BRT systems, makes very inefficient use of the ROW. Trains almost always stop right on the track, blocking it, and thus must have a very long headway. A gap of 3 to 5 minutes, even at rush hour, is common, though it is possible to do better. Road vehicles tend to run with 2 second headways and it's possible to run robotic convoys on sub-second headways full-time since vehicles do not block the road in stations. To understand where transit might be going, the first hurdle is to shed the old preconceptions based on the 19th and early 20th century technologies currently used in transit. In the future we'll examine more about the optimum vehicle size and the trade-offs for people of all classes of income and questions of comfort and time that go beyond efficiency, because in richer countries, people care more about the quality of their ride than the cost. "A 10 person robotic van need be no larger than today's sedans"
What? That sounds like an exaggeration. I don't see how you could fit 10 people in a vehicle the same size as a typical four-door 5-seater. Take out the hood and trunk, because it's battery-powered and the puck is underneath; then remove the steering wheel and dashboard, because it's robot. Now you have a lot of open space in the same horizontal footprint. Take a typical medium to full size sedan. The Toyota Avalon is 73" wide and 196" long. There are sedans and SUVs that are bigger than that, but it's in the upper-middle range. Consider airline coach seats which are 17" wide and 31" in pitch when cramped. They would actually fit 6.3 rows and 4.3 columns in that space for 24 passengers. Fortunately we don't need to do anything nearly that bad. You can get 3 columns at 24" width which is wider than most business class seats. You could get 4 rows at 49" pitch which is again a very luxurious business class. So that would actually be 12 people in superb business class comfort. But wait -- there is no aisle. Unlike a plane there is no need for that -- enter from doors on the sides. People are assigned seats based on when they will be boarding and departing so the middle seat is the person departing last. Unlike a car, our van does not need a big trunk and big engine. It's electric, with the battery pack in the floor and electric motors taking minimal room. It is not as aerodynamic as it could be, so you might narrow the back to 2 columns to get closer to a teardrop shape which has the lowest drag. But if it's not going on the highway you're OK.
Now, 10 was me being conservative. A robotic van can drive perfectly down its lane. If it keeps itself to major streets (which it would do) with 12' lanes it could actually be 11 feet wide and drive fully reliably in its lane. Do that and it's 5 columns wide (enter from both sides) at 26" wide seats (middle seat is no problem) and with 5 rows it's 39" pitch -- better than premium economy on the plane. 25 people in the space of a very fat sedan. That sedan would be seen as a bit of a whale to the other drivers on the road because of its with, but not to the robots. I suspect it would be better to go narrower and longer but then it doesn't fit the length of today's cars. My most common vision is 4 x 4 -- 8' wide (24 inch seat width) which matches today's RVs, and 4 or 5 rows. 3x5 also could be a good configuration, only one middle column. How practical is it to expect passengers to enter from both sides? If you have an offline loading area, that seems perfectly doable, but otherwise I expect that some people will have to walk into the road to open the door and get in. Not a showstopper given that this is how UberPool already works, but not ideal either. If you wanted to do super dense, you could also have a vehicle do some stops on the left, some on the right, though fewer places allow such turning around. But robots will be very fast at turning around, they will back up with full confidence, unlike people. If you give them special features like 4 wheel steering, they can even turn in place. But I don't think we need to go that far. Clearly an 11' wide vehicle is mostly going to transfer passengers in special spots with platforms on both sides. In fact, my vision is these vehicles always only transfer at stations with platforms. That's because they are not your door to door vehicle -- you ride a single person robocar to and from them, or walk to a "station" -- but a station is just a piece of pavement with raised platforms on either side. Lots of good information in this post. I'm very much a fan of on-demand transportation shared only with people who I choose to share with. I'm glad to hear that this isn't going to be terribly inefficient. With 1-4 seater robocars being so efficient, will there even be much demand for 10+ seater vans? Football teams. Company retreats. Other situations where the 10+ people are going to be interacting with each other during a relatively long trip. But for a normal daily commute, why go through the hassle of transferring to a large van and sharing your commute with strangers? On the right-of-way front, do you foresee restricting some highways to robocars only? With only two lanes in each direction (plus an acceleration/deceleration/weaving lane at on/off-ramps), you can fit a lot of traffic with virtually no traffic jams if you restrict access to robocars which communicate wirelessly with each other. Vans with 10-20 seats won't be primarily for groups that know one another. I an looking at them as the replacement for larger transit vehicles. The 10 people will be strangers, but will have a rough origin and rough destination in common. You want this for rush hour capacity to exceed subway lines. Subway lines can do about 30,000 to 50,000 people per hour -- many of them standing. A road lane with 16 person vans with one second headway does over 50,000 per hour -- all seated. The optimum vehicle size will be the result of a complex spreadsheet based on capacity needed, disparity of routes (is everybody going downtown or is the town more spread out?) and re-use of the vehicles during the day. The larger the vehicle, the harder it is to make efficient use of it outside of rush hour. So you're saying that there isn't enough road capacity for rush hour without using 10+ person vehicles? I assume this is talking about places (major cities) where mass transit is already a necessity? It's going to vary on the city, so you have to do the calculation for each route and city. And of course, as capacity increases (be it with new vehicles or new roads) then demand rises to fill that capacity, seemingly without limit in the modern world, but not really without limit. There is also the issue that while total capacity over an entire road network can be high, the shortest route (and there are bottlenecks) is always the most popular and you want to get the most out of it. In addition, the more margin you have between load and capacity, the more regular and predictable the flow is, and accident risks are fewer. So yes, if you have 15 people at A who all want to go to B at the same time, it is efficient (and cheap) to have a van for them. Definitely some places where this makes sense. Not so much because it's cheaper or more efficient, though, but because it'll be more convenient without being much more expensive. The convenience of a cab with the cost of a bus or subway ride. One thing I'm curious about is the 45-60 minute suburban commute. I don't have this now (my current commute is a pleasant 10 minutes), but several years ago I used to do this every work day. A single-person robocar would make that commute so much better, as one could get work done on the commute. I wouldn't want to share that commute with strangers, though. In fact, I would strongly prefer my own robocar there, so that I could customize it into a mini-office. Yes, that could theoretically be done with a sharing model, but sharing a workspace with others tends to be inconvenient. If a single-person roaming office robocar would be anywhere near the cost of sharing a van with 9+ strangers, I'd much prefer the former. I wouldn't even particularly care if the commute took twice as long. Yes, you would prefer your private car. The larger van, in my vision, is not that bad -- it's not like a bus for the long commute, it's like business class airline seats, and of course it has a desk and a screen for you. And yes, it should be perhaps 1/4 the price, so that's one factor. But the other factor will be policy. Because the cities want to manage congestion, they will implement policies to encourage the van over the personal ride for any sort of long commute through a high-use area. So the van may get access to dedicated lanes for a faster trip (as carpools do today) or there may be congestion charges which are placed on vehicles with just one person, making the van 1/8th the price. If there is a big price difference, I see even the wealthier taking it. The city can adjust the congestion charges until enough do. Are those numbers at all realistic? I thought one of the points of the OP was that a 10+ person van is *not* much less expensive (or congestion causing) than a bunch of 1-2 person robocars. Maybe I misread the OP. I have not built the spreadsheet, so it's based on some simple back of envelope stuff. I figure the van probably costs 5x as much and uses 5x as much energy, but only 2.5x as much road space as the single person car. But that gets shared among 15 people. The congestion charging is the key factor. If the city needs more capacity, it gets that by encouraging more vans. It does that by putting a congestion charge on. It could either be a "fair" one (van plays 2.5x the congestion fee of the single person car, but splits it among 15 people, so van pax pay 1/6th of what people in the single car pay, or it could be a biased one, where you just charge the singles and not the larger vehicles. The latter is more what they do today -- carpool lane is free to carpools, pay for solos. A city can just keep increasing the charge until more people ride in more group vehicles until it has enough road capacity. Also have to factor in reusability. I'm not sure what the use would be for a 15-passenger van equipped with business class seating with desks and screens, outside of rush hour. Whereas a 1-4 person robocar is extremely reusable. Especially when you consider the usefulness of parking them all over the place in order to reduce response times. I guess it depends on just how much those congestion charges are, though. As well as how easy it is for the robocars to route around them. That is one of the factors in the model I hope to develop that calculates the optimum vehicle sizes and fleet distribution. But realize today we have mostly buses with 40 seats (or rather, fewer seats and standing room) as the transit fleet. Today, the non-transit "fleet" (ie. all the cars) that commutes just drives in, parks all day, and comes home, while the transit fleet circulates all day. This might actually be backwards from what we want -- group vehicles for rush hour, small ones for off peak. The governing factor is getting enough capacity at peak. The problem is induced demand -- more capacity triggers more demand, so you start needed to move more and more people into vans to increase capacity, even if the vans do little else during the day. What they do in the day depends on whether its cheaper to use a 15 person van to move smaller groups than to have more small cars in the fleet. Clearly you don't want to go too far in that direction of using lightly loaded vehicles (as we do with transit today.) Though the waste of these vans with 5 people will be much less than for a bus with 8. Fortunately, the off-peak is not as small as we imagine. To pool people together off-peak requires that some of they alter the time of their trip. Many might do that for a nice cost saving. The idea that more capacity triggering more demand is a problem reeks of central planning. As long as companies are setting prices at least as high as marginal costs, they'll make nice hefty profits. By offering discounts for certain groups (those who purchase monthly commuter passes, for instance) they can capture even more profits. And none of the buyers are being forced to buy, so they're all gaining something too. Yes, the concept of induced demand is a central planning problem, by and large because road infrastructure is centrally planned. For a while, planners thought that the way to deal with congestion on a roadway was to add a lane. They discovered that the benefit was usually temporary -- people moved off other roads into the new lane, and eventually they moved their houses into the now more attractive locations along that road for the shorter commutes. Which then vanished. So now they look to other solutions. The good news is that metering of roads can get rid of induced demand going over capacity, because you just don't let more cars on the road than it has capacity for. But with van transit, you can just keep dialing up the capacity if you want to, as long as people will share the vans. If cost savings is the way to convince people to pool together off-peak, a 15+ person van with people packed like sardines is probably better than a 15 person van with luxury seating. Then again, maybe there's a way to make a van that's convertible. Luxury business seating during the day, packed like sardines during off-peak and during special events (like sports games). This depends on the cost of making it convertible. I am not sure that is a great answer. You can always serve budget customers with the higher end product, so usually what they do is just make a bit more high-end product to be sure they have enough for that for the high paying customers, and sometimes you get a free upgrade. That's cheaper than making it convertible. Some people care about cost, some care more about comfort or other things. The market will make vehicles to serve all these needs. The government's role should be to price the real cost of externalities (including congestion) into road fees. But road fees are politically unpopular, so there is work to do to make that happen. If it does, then people will share if it gets them sufficiently lower cost or, even better, access to premium lane space. Today's carpool lanes are failures -- 90% of the "carpools" are not induced, they are couples and other people who would normally ride together. With a carpool lane limited to true carpools and vans, never allowed to go above capacity so it's always a fast ride -- people will share to get in that, even if they are rich. But they will share in biz class seats if they are rich, of course. Definitely don't agree with you on the role of government. A right-of-way should not cost money to access. Unfortunately, it might happen. We'll see. The right way to get the government out of it is to price the true cost of all externalities into use of public resources (including government ones.) Then entrepreneurs are fully motivated to meet public goals while also making themselves rich with their innovations. Some people don't like the idea of road charging, at least in the USA, though it is starting to catch on. However, there are alternatives to charging, such as lotteries, rewards for pooling (which is what carpool lanes are) and a few others. I agree that road fees are politically unpopular yet they can be both efficient and very capable of managing congestion compared to fixed fees such as registration and licensing. So it may be politically easier to have two separate payment systems, at least while private ownership is so dominant. Despite the duplication of bureaucracy a natural separation could be Private vehicles and Mobility services. Leaving private owners on the existing fixed fee system and requiring mobility companies to pay by the mile could avoid the difficult politics, and my guess is public resistance to road fees would be strong. A split payment system could be seen as a transition phase that may only be needed for a few decades. The political problem is that congestion charging means "the roads are for the rich, even though everybody paid taxes for them." Same with gas taxes. One option might be to use the revenue from charges to rebate the contribution you made to building the roads. So if you don't go on the roads, you actually get money back. If you use the roads modestly, it's neutral, and if you use them a lot, it's net payment. So using them a lot becomes for the rich -- but not because you paid for them with your taxes. My favorite alternative to charging is not charging. If anyone should be charging for the use of a right-of-way, it should be the land owner, not the government. But then it wouldn't be a right-of-way any more, by definition. Because when it comes to transportation right-of-way, including transit lines and major roads, the landowner is almost exclusively the government. Some train lines are privately owned and used by commuter trains. But the rest of it tends to be owned, built and maintained by governments. I'm not sure what jurisdiction you're talking about. It varies in various states and countries, but in the ones that I've lived in, the government doesn't own the vast majority of the land on which the roads are built. Interstates and certain toll roads are usually an exception to that generality, but most of the land on which local roads are built are owned by the owners of the homes adjacent to the roads. A right-of-way is an easement. It allows the public to travel on the land of another without permission or payment. Charging for use of a right-of-way contradicts the very nature of a right-of-way. To the extent the government does it, it's really a tax, not a "congestion charge," regardless of what they want to call it. In places where the government owns the right-of-way, that is the underlying problem. I admit to not having seen that. If it's true for my land I've seen no evidence of it. The city has complete and total control over the street and sidewalk in front of my house. I can't use it any more than the rest of the public, nor can I modify it or do anything on it. If you "own" this road it is really just literally titular, none of the other rights of ownership come with it. The government controls who can pass on it, and if it wants to meter use of the roads I don't know of any barrier to that.